When I was seventeen years old I become a vegetarian as well as a skillfull forager. I was the salad queen. It seemed as if I could make a salad appear out of the ether. I would wander through backyards and gardens, searching through hedges picking this and that. Without fail I could produce a bowl of tastiness that was not only packed with goodness and seriously delicious, but also a delight to look at. Full of edible flowers and weeds. Most times chickweed was the base ingredient. When my eldest was a toddler chickweed was a staple of his diet, in salads, sandwiches and soups. Yup, those were the simple times. Recently my mum was reminiscing about my weed salads, and I wondered why I stopped making them. There’s probably lot’s of reasons and having a massive vege garden that provides generic salad greens is the main one most likely. You’ve worked so hard to cultivate them, of course you consume them, that’s obvious. But I can see myself when I’m much older and gardening is not so easy. I’ll be more than happy to go back to my old ways of foraging, gathering a bit of this and a bit of that. Common names; chickweed, common chickweed, chickenwort, field chickweed, starweed, starwort, mischievious Jack, winterweed. Description; There are many different varieties of chickweed. The variety we are discussing here, stellaria media is a low growing, sprawling annual, that readily covers newly cultivated ground. The plant forms a dense mat that smothers other plants, the stems taking root as they trail the ground. The slender stalks have hairs growing in a single fine line along their length. The leaves are light green, untoothed, smooth and oval, growing between 1/2 to 1 inch long in opposite pairs. The small, white, star-like flowers have five petals so deeply cleft they appear as ten. Underneath each petal lies a slightly longer green sepal. The plant can mature and produce seeds in 5 to 6 weeks. The seeds can remain dormant for many years, germinating when the ground is freshly cultivated. Preparations; ointments/balms/creams, fresh squeezed plant/ poultices, dried herb/ fresh herb, teas/tisane, extracts/tinctures, homeopathic remedies. Habitat; Widespread throughout most of the world and most climate zones. Origin may be eurasian but has now established itself worldwide. Chickweed prefers a moist soil, in an open sunny or partialy shaded situation. Traditional and Historical uses; The Native American Indians used chickweed for the treatment of respiratory illnesses such as sore throats, coughs, colds and influenza, bronchitis and whooping cough, as well as a general tonic. In Europe chickweed was also used as a tonic and in the treatment of tuberculosis. 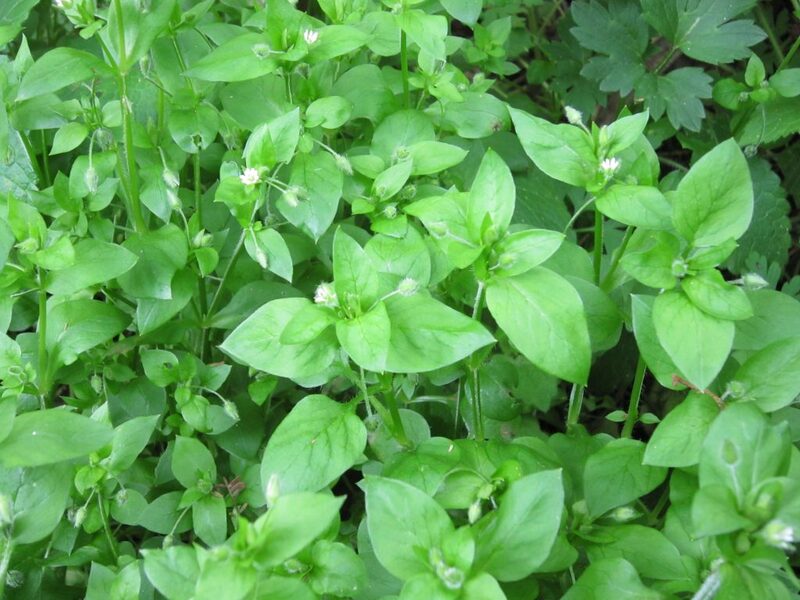 Traditional Chinese herbalists used chickweed tea for nosebleeds. Shaker communities used chickweed to treat eye inflammations. Therapeutic actions; astringent, carminative, demulcent, refrigerant, vulnerary, expectorant, anti-tussive, anti-inflammatory, circulatory tonic, emmenagogue, galactogogue, diuretic, mild laxative. Current Herbal uses; Externally; Most well-known for pruritis and itchy skin. Used on eczema, psoriasis, acne, haemorrhoids, varicose veins, ulcers, burns, boils, abscesses, insect bites, stings and urticaria. Cooling and Soothing. Internally rheumatism, joint inflammation, chest infections and constipation. Food uses; raw lush tops in salads, sandwiches, in juices, as a pot herb, in soups and stews.